Whether your wedding colors are blush and bashful or burgundy and navy, cut wildflowers from your own garden will go with almost any color pallet. Did you know growing these bouquets of pastel-hued flowers or fiery reds and yellows can be done right in your own backyard? The important thing is to be creative, maximize your growing abilities and time your blooms with your big day. Choose hybrid, pollenless varieties of sunflowers for bouquets and centerpieces. Varieties that are single-stem will produce one beautiful stem per seed or plant in a short amount of time. Choose from a variety of shapes and colors. Golden yellow sunflowers with dark-centers are classic, but ones with green centers or lemon-hued flowers make for unique looking bouquets. Grow in full sun or part shade in Zones 1-10. Feed blooms with Espoma’s Bio-Starter Plus when you plant for extra flower power. Find zinnias in a variety of bright and beautiful colors. These plants bloom from mid-summer until frost and are one of the easiest wildflowers to grow. Plus, the more you cut zinnias, the more flowers the plants will produce. 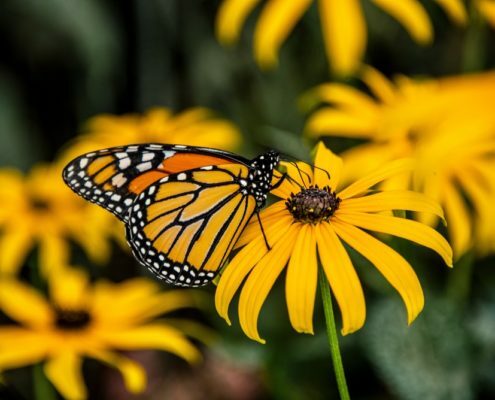 While these flowers are deer resistant, they are monarch butterfly favorites. Grow in full sun in Zones 1-10. A popular cut flower, cosmos will add a pop of color to any bouquet. Their pink, crimson, white or chocolate flowers last until frost and are attractive to both butterflies and hummingbirds. Flowering non-stop, two to three inch blossoms grow on fern-like stems. 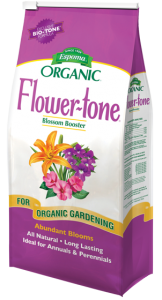 Feed throughout the growing season with Flower-tone to get fantastic blooms. Grow in full sun in Zones 1-10. With their white rays and yellow centers, daisies brighten up any bouquet. They grow 1-3 feet tall and will not take up too much space in a garden or bouquet. Feed regularly with Bloom! liquid plant food for vibrant whites and beautiful fragrance. Grow in full sun in Zones 3-8. Named for their dark brown centers peeking out of the gold or bronze petals, black-eyed susans thrive in the sun. These daisy-like blooms are perfect for a late summer or fall bouquet. They tend to grow to about 2 feet tall and handle high heat and drought conditions well. Grow in full sun in zones 3-9. It’s time to make the cut once your wildflowers are in bloom. Cut stems in early morning or late evening to prevent wilting from the harsh sun and heat. Strip any foliage that will be placed directly in the water. Leave foliage near top of the stems for added interested and filler in your bouquet. Thinking bulbs might be a better fit for your wedding bouquet? Find out how Garden Answer gets beautiful blooms. It is that time of year again when those tiny whining noises can be heard buzzing by your ear. Mosquitoes are back! You can keep these pests at bay by using nature’s own recipe for effective mosquito repellents. It is a matter of comfort to keep the mosquitoes away, but it is also a matter of your family’s safety. By keeping the mosquito population around your house to a minimum, you reduce the risk of being exposed to mosquito-borne diseases. Tell those mosquitoes to bug off by fighting them naturally. Avoid chemicals by planting a mosquito repellent garden. Read about our top choices for mosquito-repelling plants below. These bright red and pink blooms have a fragrant lemon and citronella-like scent, which is delightful to humans but extremely repugnant to mosquitos. Geraniums prefer a warm, sunny, and dry climate and work in the garden or in pots. Hardy in Zones 3 through 9. Plant with Espoma’s Bio-tone Starter Plus to give plants the nutrients they need. Basil is one of the handiest plants around. Add it to your favorite meal, drink or simply enjoy its wonderful smell. One of the biggest perks is that it emits a mosquito-repelling aroma without having to crush the leaves. Prevent mosquito bites by rubbing a handful of basil leaves on exposed areas of the skin. Research in the 2011 Malaria Journal found that basil was discovered to be up to 100% effective in preventing mosquito bites. Hardy in Zones 1 through 10. Marigolds have earned the “most pungent” superlative from the plants on this list. Their smell has not only proven to be offensive to mosquitos, but also to rabbits, deer and some people. Despite the smell, their luminous orange and yellow petals brighten up your garden. They enjoy full sun and fertile soil. A major plus is that marigolds make great companion plants for tomatoes, protecting against other insects that eat the plants. Hardy in Zones 2 through 10. Fertilize with Espoma’s Bloom! liquid fertilizer for great looking marigolds. Add vibrant purple to your garden by planting lavender. Lavender gives off a sweet aroma that is attractive to humans, but most definitely not to mosquitoes. 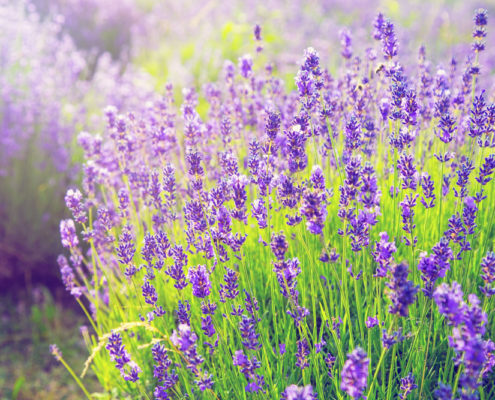 You can rub lavender on your skin to use as a natural mosquito repellent, too. Lavender prefers full sun with well-drained soil. Hardy in Zones 5 through 9. Feed with Espoma’s Plant-tone throughout the growing season. Rosemary, a member of the mint family, will most definitely keep the mosquitoes away. This Mediterranean favorite is one of the most aromatic herbs you can grow. Grow in full sun and water when dry. Although you don’t need to prune, you can cut back branches to help your rosemary bush stay in shape. Both fresh cuts and dry cuts are effective in repelling mosquitoes. Add rosemary to your summer fire pit so when it burns it gives off incense that is offensive to mosquitoes. You can also make rosemary into oils, add it to meals, or even make natural repellents. Hardy in Zones 6 through 9. Summer Rayne Oaks of Homestead Brooklyn demonstrates the ins and outs of repotting bromeliads. Follow along as she explains the difference between the pup and mother plant and what happens when you remove the pup vs leaving it on to continue growing. Utilizing her expansive collection of plants, she shows us what both scenarios look like in the repotting process. Summer Rayne teaches you how to get a brand new bromeliad from a plant that is about to expire. With the right care, she was able to get new life from the plant. The best soil to use for bromeliads is a barky airy mix, such as The Espoma Company’s Organic Orchid Mix, that’s full of nutrients. Once the pup is either 1/3 to 1/2 the size of the mother plant, you can decide to remove the pup for the mother to grow another or keep it on and watch it grow from the mother until it expires. Grab some gloves. Some of the leaves are going to be prickly, so you want to protect yourself. Grab scissors or sheers. If the mother plant is desiccated or if you want to remove the pup before repotting, you will need something sharp to remove them. Remove the bromeliad from the container and separate it from the mother plant, if possible. When placing the bromeliad into the new container, center it and fill with Espoma’s Orchid Mix. You don’t need to tuck it in too hard, as it likes having room to breathe. Water it in well to help it settle into its new home. *Remember, if you have a healthy mother plant and a healthy pup, you can plant them together or separately. You won’t harm it either way. Need a new and updated way to grow your strawberries? Try growing them vertically! This windchime inspired planter will add life to your garden while adding an element of design to your home. Watch as Laura from Garden Answer shows us how to make vertical strawberry planters. Be sure to keep the materials in mind – even Laura almost used toxic tubing for the project. Connect your galvanized tubing. There is a rivet on where they should connect – be sure to work from one end to the other to make sure it is secure. Drill a drainage hole in the bottom of the cap with a metal drill bit. Place the cap on the corrugated end and use 5 self-tapping screws to secure. Measure your planting holes. Start an inch away from the seam to keep the integrity of the tubing. Each hole should be 7.5″ away from each other. Use a pencil to mark where to drill. This will be your starting place. Drill your holes with a 2.5″ bi-metal hole saw. Ask one person to hold the tubing while the other saws. You will end up with about 15-16 holes. Safety tip: Wear long sleeves, gloves and eye protection to protect yourself from the metal. Keep your gloves on while handling the tube as it is sharp. Drill 3 holes in the top to get it ready to hang. Attach 1/8″ quick links to each of the holes. Connect your chain to the quick links. Add one more quick link to the end of each chain and each of those will go into one 1.5″ ring. Starting from the bottom hole, add in Espoma Organic Potting Mix and Bio-Tone Fertilizer. Pro Tip: Mixing Espoma Organic Potting Mix with the Organic Bio-Tone Fertilizer allows the strawberries to get a boost in their new container while releasing nutrients slowly to ensure the edibles are being fed for a long time. Plant each hole with a strawberry and move your way up! You can also add a plant at the very top! Take little pieces of moss and add them around the strawberry plant. This will help keep the plant inside of the planter and help clean up your project. Hang your planter with a hook (Laura uses an S-hook). Slowly water in your new planter – watering too fast can make the plants fall out since their roots haven’t been established yet. Find out how Laura from Garden Answer makes this clever indoor cat tower garden! Laura uses Espoma’s Organic Seed Starter to get her seeds off to a great start. Add an extra special kick to homemade dishes by incorporating fresh herbs from your kitchen garden. It’s especially easy when flavorful herbs just need to be snipped from your kitchen windowsill. Grow a winter herb garden in your kitchen with easy herbs like rosemary, chives, oregano, thyme, lemongrass and mint in just a few steps. Herbs are perfect for growing in the kitchen. Be sure to feed with Indoor! plant fertilizer to give them a boost. Pick a container. Visit your local garden center to purchase herbs and pots. Choose 6” containers that have drainage holes and saucers. Herbs don’t like wet feet. Pot up your herbs. Fill containers halfway with Espoma’s Organic Potting Mix. Remove herbs from containers by pushing from the bottom. Gently loosen roots and place plant in the pot. Fill with soil to the depth the plants were growing in the original pots. Water well. Choose a Spot. Place plants in a sunny window that receives at least 6 hours of strong sunlight each day. Refresh plants. Water as needed to keep the soil lightly moist, but don’t overwater. Give herbs a boost. Feed with Espoma’s Indoor! liquid plant fertilizer as needed to give plants the nutrients they need. Once warm weather does arrive, get ready to plant more veggie crops! With Valentine’s Day right around the corner, there’s a lot of pressure to find the perfect gift, we made it simple. Give something that will live long past the special day – Red Houseplants! The best part yet? These are perfect gifts for your special guy or girl. Visit your local garden center to surprise your love with a beautiful new plant today. This lovely houseplant has heart-shaped blooms called spades. Be sure to buy one in bloom to ensure your significant other sees the heart on your sleeve plant. Anthuriums love light, so be sure to place them in a bright area, but not directly in the sunshine. This easy-to-grow houseplant is the perfect gift. It provides an exotic touch of red to any home. Even with the thick foliage and wide leaves, it gives off a radiance that anyone will fall in love with. Be sure to use Espoma’s Orchid Potting Mix to allow proper drainage and vitality. Feed regularly with Indoor! liquid fertilizer to keep your plants happy and healthy. Succulent love! This succulent produces clusters of tiny red flowers which will last for several seasons. The scalloped greenery is just as gorgeous as the flowers, so you will have a showstopper year round. Use Espoma’s Cactus Potting Mix and Cactus! liquid fertilizer to be sure your Kalanchoe is happy and hearty. Red can be too much for some lovers, so crotons offer the perfect balance of greenery with a subtlety of red. But don’t let it fool you, this houseplant is a bold contender. It offers texture and design to any household that needs extra energy. Crotons also help purify the air, which in turn keeps you calm and relaxed. Another more subtle red houseplant, the Red Aglaonema is a standout in home décor. The bold foliage adds height and eye-drawing texture. Your significant other will love this easy-care plant. Trust us, gifting any of these romantically red houseplants will show your love for years to come. Feeding plants with Espoma’s Indoor! liquid fertilizer helps keep their red vibrant. What else can you give for Valentine’s Day? Try a cute and creative gnome garden! Dreaming of juicy, flavorful tomatoes and ripe, spicy peppers? Grow them yourself in only a few months. If you’re as excited about tomato season as we are, why not get started now? The best way to get a head start on growing tomatoes is to start seeds indoors 4-6 weeks before the last spring frost date in your region. Whether you’re growing cherry tomatoes or hot peppers, visit your local garden center to pick up supplies and seeds. If you saved tomato seeds from last year and stored the seeds properly, they should last for about four years. Pepper seeds will last about two to three years. Check seeds for vitality before planting for a successful crop. Need seeds? Find them at your local garden center. Test your seeds a few weeks before you’re ready to start. Place several seeds on a wet paper towel cover it with plastic and place it in a warm spot. If the seeds are viable, they should sprout within a week. Give your seeds a head-start. Simply soak seeds in warm water for 2-4 hours to soften. Read the instructions on the seed packet to ensure the optimal conditions for your seeds. Gather supplies and fill seed trays to within ¼” of the top with Espoma’s Organic Seed Starting Mix. Follow instructions on the seed packets to see how deep and far apart to plant. Cover with soil, press down and lightly water. Find out more about starting seeds here. Once the seeds are planted, it’s time to warm them up. Heat loving crops like tomatoes and peppers love the warm weather. While your seedlings are sprouting, store them on top of the fridge or in a warm place. An even better option is use a special heating mat. The warm temperatures help to speed up the growing process. Make sure to check seeds daily for moisture since the soil may dry out more quickly. Once the true leaves have developed, seeds will benefit from a nutrient boost. Add Espoma’s Organic Tomato-tone, a premium plant food formulated specifically for growing plump and juicy tomatoes. Thinning is the process of removing weaker seedlings to allow more room for the stronger ones. It creates healthier plants that produce more. As seedlings grow and you see crowding beginning to happen, gradually thin plants to 4” apart by gently pulling out the smallest ones with your hands. Start hardening off plants once the last frost date has past. Place seedlings outdoors for seven to 10 days for a few hours each day. Once plants are ready for transplanting, gently remove plants from containers without damaging the roots. 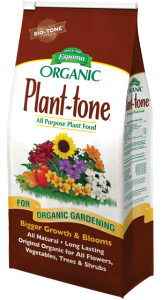 Plant in a prepared bed and mix in Espoma’s Bio-tone Starter Plus, to keep roots strong. Sometimes we find a beautiful houseplant and have no idea on where to put it. Other times we have a space that needs filling and no idea what to put there. The way we see it, you can never go wrong with more plants! There’s no better place to start adding plants than the kitchen. If you haven’t thought of adding plants there before, you’re missing out! Houseplants in the kitchen aid in decreasing cooking scents that consume your home – while it might smell amazing when you bake cookies, cauliflower can really bring you down. Or, you can grow edibles in your kitchen to have easy access while cooking. Herbs are perfect to grow in the kitchen. Place your herb garden on your windowsill or in a hanging basket for ease. Luckily, a lot of herbs grow well indoors with adequate light. They need to be rotated if they start to become leggy. Read more about growing herbs in your kitchen. Aloe Vera is one of the easiest plants to grow, so keeping it in your kitchen will bring life there all year long. It’s especially great to have in the kitchen to use its natural coolant in case of a burn. It will do well anywhere in the kitchen, although next to the stove is probably best. Read more about growing aloe and other succulents. The soft jasmine scent that is released from the blooms of this plant will help keep your kitchen smelling nice and fresh. The scent is subtle enough that it won’t overwhelm the kitchen yet can still help keep your space feel clean and refreshed. Read more about growing jasmine. Ivy is a diverse plant that can thrive in many rooms. Putting it in the kitchen will add dramatic lines and textures while purifying the air. If your cabinets don’t hit the ceilings, this ivy will gladly take up space. It will add wonderful shades of green with accents of whites or yellows. Read more about growing ivy in unusual spaces. Another great air purifier, the spider plant will help keep cooking more enjoyable. Place it somewhere you need to add height and texture to an area. It is an easy-care houseplant that will continue to love you in every season. Read more about the benefits of houseplants. Don’t forget, all of these plants need to be fed as directed with Espoma’s Indoor! liquid fertilizer in order to grow strong and highlight their colors. Need more inspiration for houseplants? Check out this paint can container that Laura from Garden Answer created!